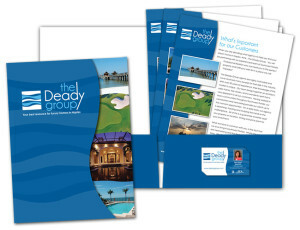 Custom printed presentation folders will help you to say a lot before you say anything at all. Creative Print Group can assist you with both the design and printing of a variety of sales and marketing presentation folders, including those for business proposals, product launches, trade show materials, customer service agreements, sales kits and much more! Just think of how much more impressed your clients will be upon seeing your shiny new branded folders. To get started on your custom print project give us a call today!